You may or may not have heard of Family Guy. You may or may not have heard of American Dad. You may or may not have heard of Ted. If you have heard of any of these, then you'll have heard of Seth MacFarlane. You may have heard of him anyway, but putting him in the context of what he's best known for will help you with A Million Ways To Die In The West. In any given episode of Family Guy you'll have a song and some fart gags. In American Dad you'll have quippy asides. In Ted, you have a bear that swears. Ahh, yes, Seth's stock tropes. You see - and I say this as a man who really likes Family Guy - with Seth you know what you're going to get. He's a funny, clever guy, but his humour always ends up throwing itself at the nearest lowest common denominator. That's not always a bad thing, but where as in the case of a cartoon episode it only lasts for 20 minutes, on the big screen it lasts for 90. Or nearly two in this case. A Million Ways... is a western. And an homage to westerns. Now, I know what you're thinking, this has been done before. Well. By Mel Brooks. So, if you're going to go up against Blazing Saddles, it had better be damn good. And the idea is a sound one - Seth and the gang look at what life was really like back in the old west. Especially if you weren't keen on fighting, shooting or dying. But from there, it kind of goes a bit awry. There's too much swearing for a start. And I'm aware of the irony of me saying that. You see, swearing is big and clever, but you have to use it well. Tarantino knows how to do a swear, it's how his characters speak. Same with James McAvoy in Filth. Somehow, when Macfarlane and friends get going, it sounds like a 14-year-old trying out the naughty words for the first time. They don't ring true. The really do feel like the writers had no other jokes so stuck a few F's in there instead. And then there's the physical jokes. While dropping a block of ice on someone's head - with resulting bonce splat and blood spurts - is cartoonishly funny in Family Guy, in a live-action film it seems to jar a tad. The same with the racially dubious humour. It's less harsh/obvious in a cartoon. It's like they can't tell the difference. Then there's the fart joke. OK, I did chuckle, but you do cowboy fart jokes at your peril - the best has already been done. Having said all of this, though, I didn't hate it. It's too long, it's baggy as all hell and my attention wandered several times, but I did chuckle several times. And the trailer had made me laugh. It's mostly down to the cast that this film works at all. Alongside Seth (who, bless him, shouldn't act), we have Charlize Theron, Liam Neeson, Sarah Silverman and Giovanni Ribisi - all of whom are thoroughly believable and play it with a straight bat to great comic effect. Sadly this highlights just how out of her comfort zone Amanda Seyfried is, her slightly drippy character ending up soaking wet. To be fair, she's on a par with Macfarlane, but the others are just so top class that it makes those two stand out in a bad way. But, still not a terrible film. Fans of Macfarlane will get everything they want out of his work. Fans of westerns will enjoy some of the more geeky touches - and then there's a nod to a modern "classic" which is almost worth the price of the admission alone. 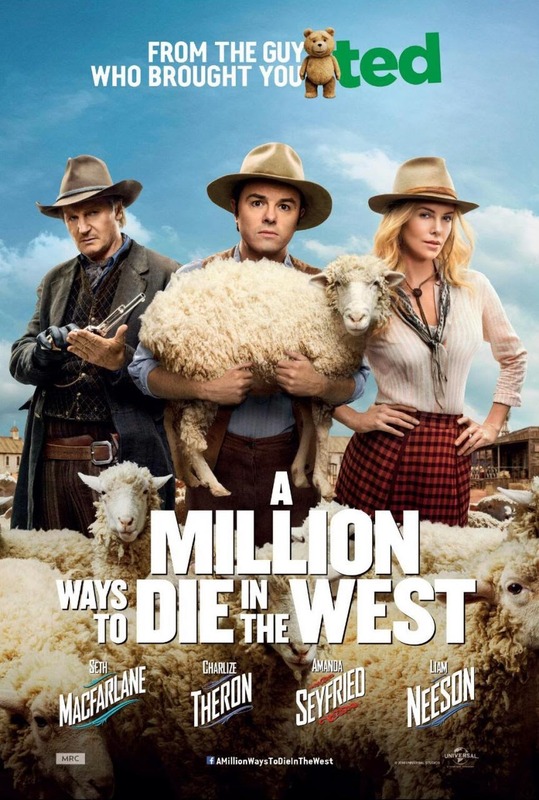 A Million Ways To Die In The West won't change your life, but there are worse ways to spend a couple of hours. (It has just occurred to me that I haven't actually touched on the storyline - there's a reason for that. While there, it's job is to string together the gags, and so it's really not important.